Shop for Organic Case Green Cotton Decorative Pillows - no boric powder ! The Goldilocks of pillows, Green Cotton pillows are a medium-firmness that’s just right and are wonderfully breathable in warm climates. Encased in our durable organic cotton twill, these pillows can be fluffed, refilled, and reused for years to come. Not sure how firm you like your pillows? Get your pillow with a zippered case and add or remove filling to suit your own preferences. Simply store any excess material in a moisture and pest-proof container, or order more Green Cotton from our Wholesale Fibers section. When your pillows are ready for a fluffing, simply unzip, empty, and restuff. 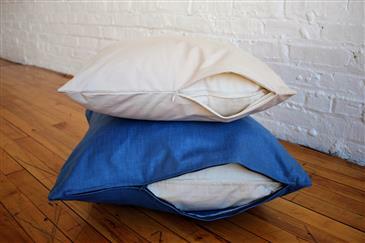 Can I pick the color of the organic cotton twill slipcover that comes with these pillows? Thank you so much for contacting White Lotus Home and for your interest in our products. Yes, you sure can pick which color casing to put on our Green Cotton Decorative Pillow Inserts. You can choose from one of the many fabrics we have to use as the pillow casing. We do not recommend the casing to be a slip on, however, our fabrics come in both a zipper and a slip on which can be used over the pillow casing. If you choose one of our fabrics for the casing we can send you a quote, as normally the casing on our Pillow Inserts are made with a natural color organic twill.